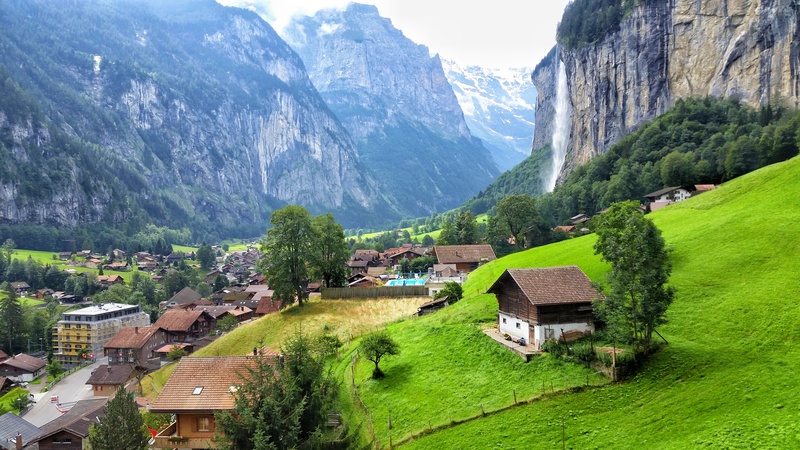 Ladies and gentleman, I present to you – the Lauterbrunnen Valley: I mean, come on. Is this even real? Luckily, it was very real, and totally jaw-dropping to behold. This is a valley carved out by ancient glaciers, and served as the inspiration for the landscapes in “Lord of the Rings”. A narrow U-shaped valley with towering walls on either side, and 72 waterfalls cascading over the edges of the cliffs above. 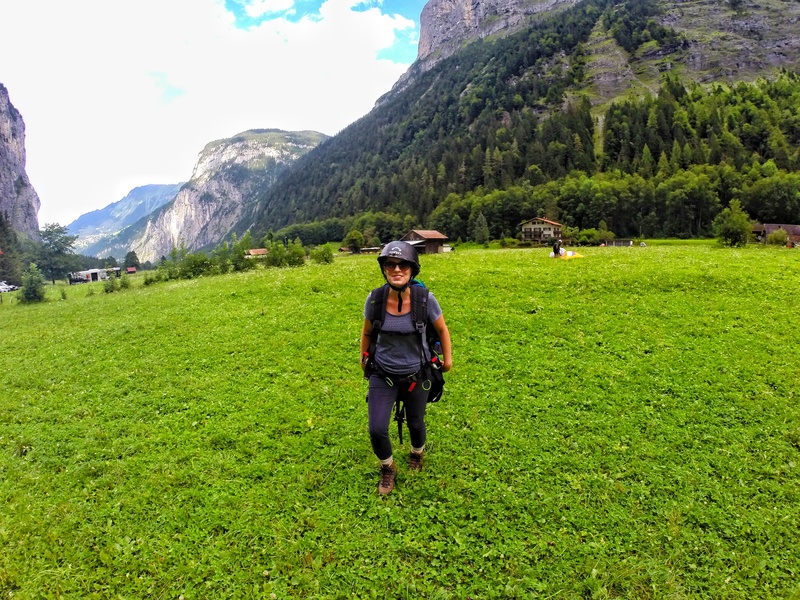 We based ourselves in Interlaken (literally “between two lakes”) but the town was merely a jumping off point for the alpine majesty of the Berner Oberland, and there really wasn’t much to see or do within the main city itself. If we had a do-over, I would definitely opt for a more picturesque village, but in the end, it was a place to sleep, and it made for short and easy trips into the more beautiful areas in and above the valley. The above picture was taken on the train ride from Interlaken to Murren, right as the train began to ascend the steep incline up on the shelf above. 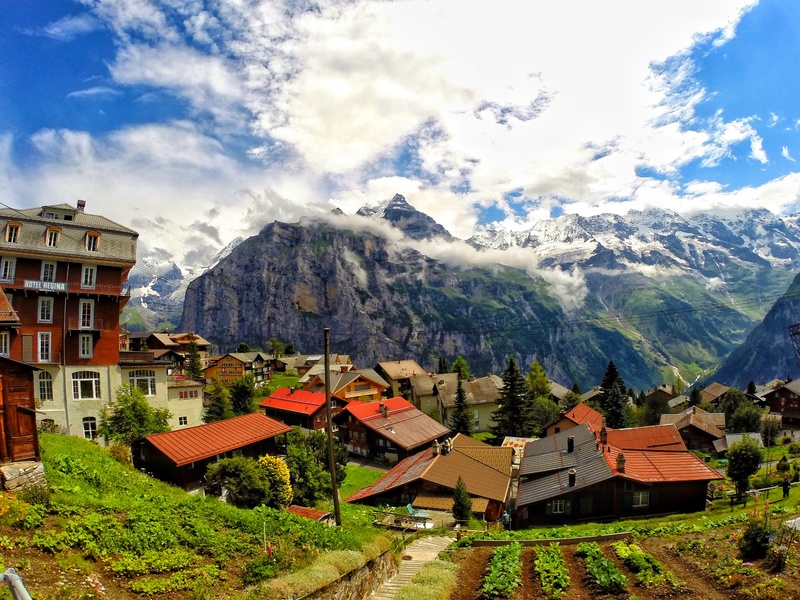 Once we arrived in Murren, we were immediately taken with it’s quaint charm and imposing mountain views. Easily seen from this area were the three major peaks, the Eiger, Monch, and Jungfrau. We finally made it to the restaurant at Hotel Edelweiss around 11:00 AM, and turns out we were the first patrons in the place, so we had our pick of seating. We assessed the layout and pretty quickly determined which table was the one from the photo. A dream became reality. Seeing the view in person after months of thinking about it was breathtaking. 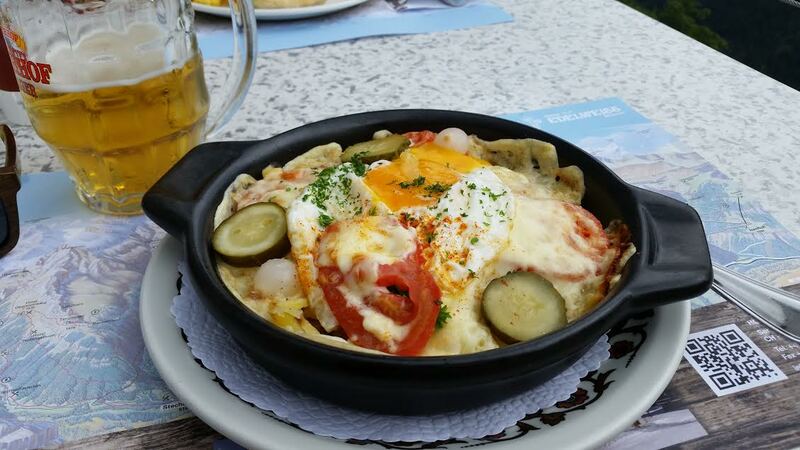 At this point, I had my first experience with Rosti, a traditional Swiss dish of potatoes, cheese, and various toppings. It was delicious, and a perfect, filling meal for the big day ahead of us. 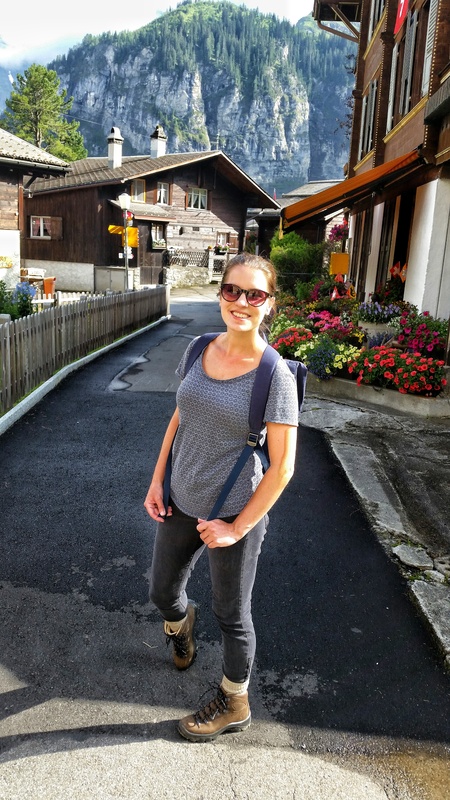 After lunch, we continued on through the very charming village of Murren, and eventually made our way down into tiny Gimmelwald, population 120. 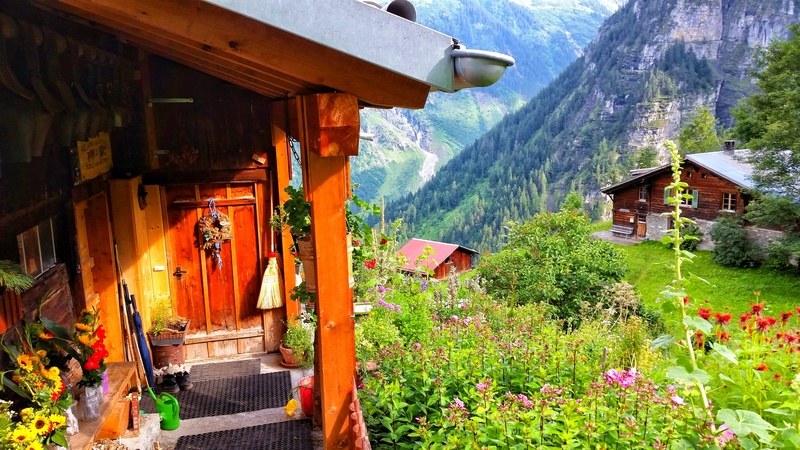 In Gimmelwald, every yard was a garden, and just about every home seemed to have rabbits wandering about the lawn. It seemed as though we wandered into some kind of fairy tale. We found a little hostel here with a lovely outdoor deck overlooking the valley floor and ordered a couple of beers and just soaked in the views for a little while. As we passed over the edge of the cliff, we saw many base jumpers preparing to leap from the ledge of the cliff. The area is pretty famous for it’s extreme sports. 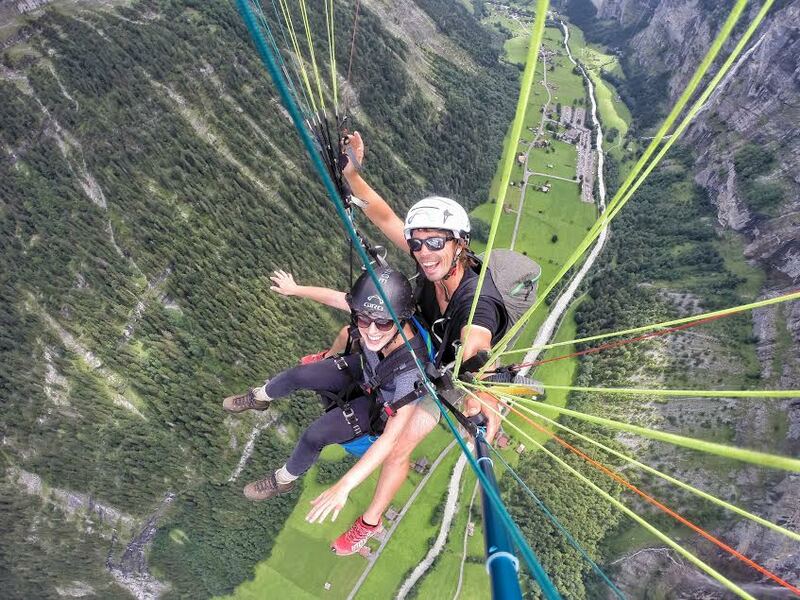 During any hike in the area, you’re constantly seeing paragliders and base jumpers randomly soar over your head, always ready with a wave and smile as they pass by. When it was all over, we both had these huge grins plastered to our faces for about an hour afterward. It was a complete blast. If you’re ever in the area, and thinking about doing it, do yourself a favor and just go for it. Even if you’re afraid of heights. Come on. 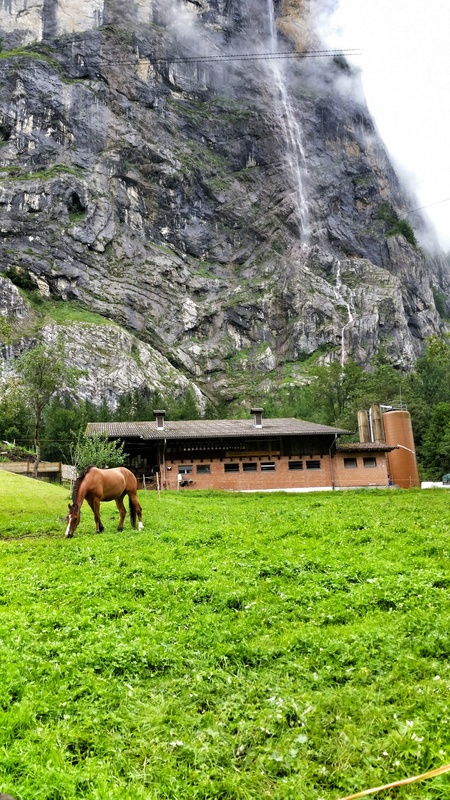 The following day, we decided to explore the village of Lauterbrunnen itself. We attempted to visit the town of Grindelwald, but the day was so rainy, there was zero visibility, and we decided rather than attempt anything high in the mountains, we would just base ourselves at the valley floor. 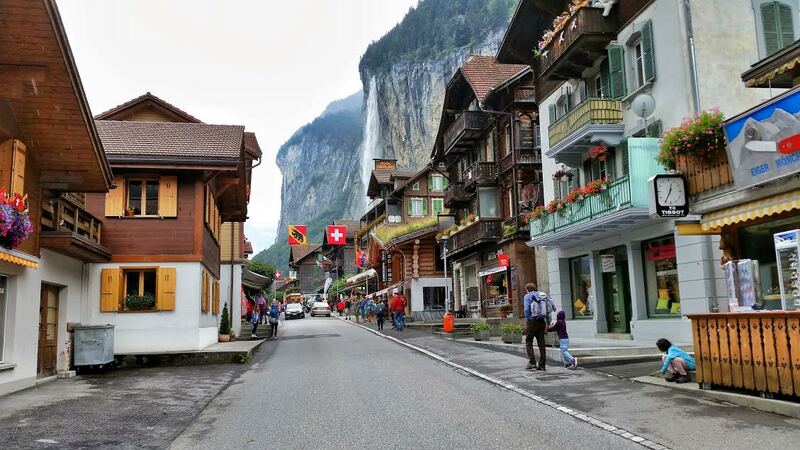 Lauterbrunnen is charming as hell. 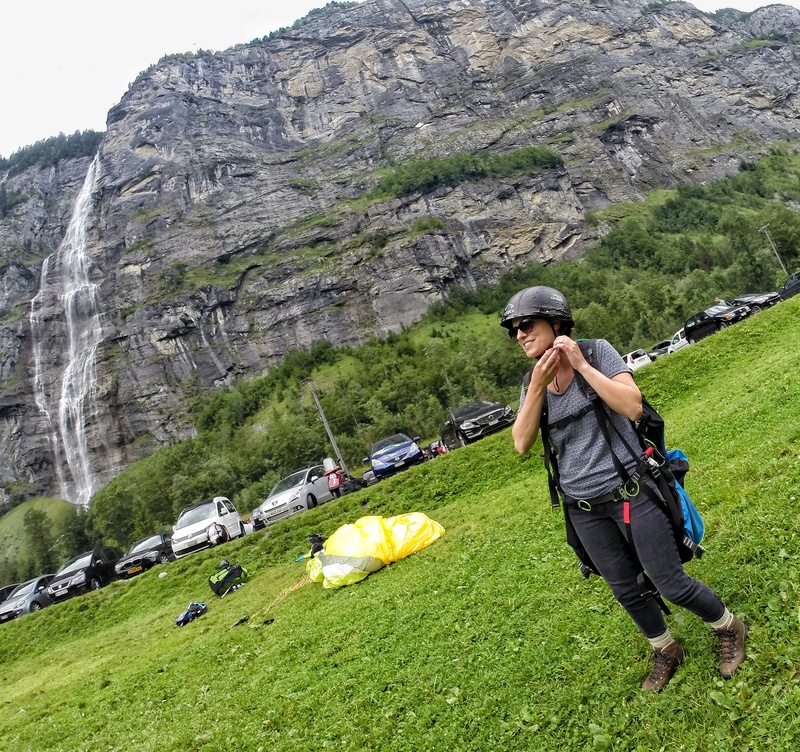 We walked the main drag of the town, with the stunning waterfall in the background, visited some touristy little shops, and spent the bulk of our time in the Airtime Cafe, drinking coffee, beer and people watching from the patio out front. We wandered through the town on the way to Trummelbach falls as well, and even in the rain, there was no shortage of crazy views. We visited Trummelbach Falls, a waterfall that has carved its way into the mountain, so you actually take a cable car inside the cliff face to get to it. Pretty cool excursion, perfect for a rainy day activity. Next up was our final leg of the journey, into the Lac Leman area for our last day. This blog has been incredibly helpful. My wife and I are going to take our 15th anniversary trip to Switzerland. 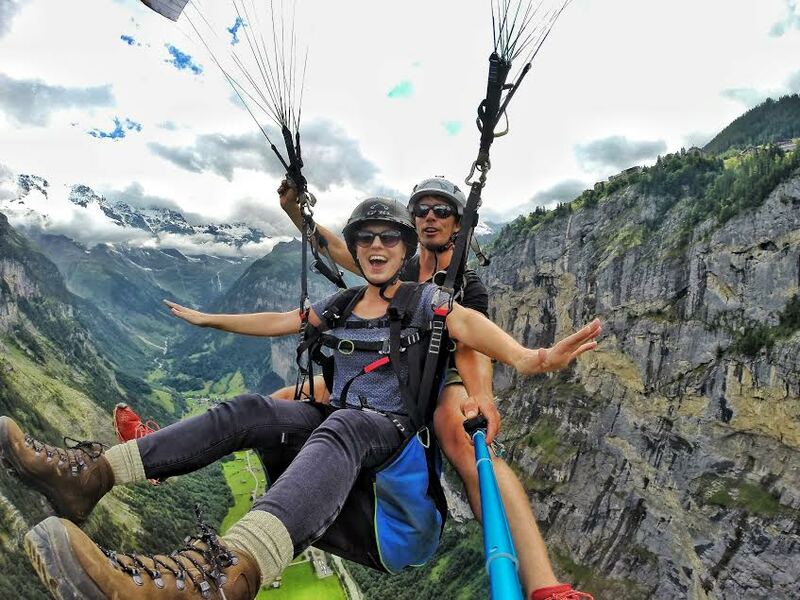 You mention that you would not stay in Interlaken if you were to do it over, but in a more picturesque village. 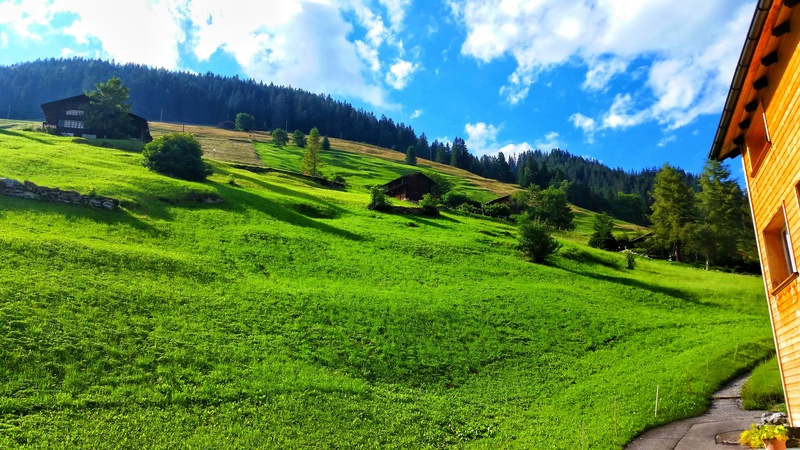 What village would you recommend instead after visiting the Berner Oberland area? 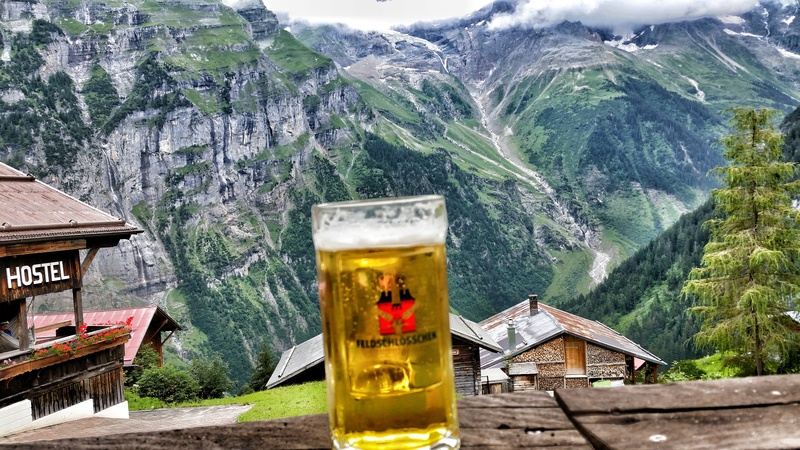 Hi Timothy – I would highly recommend staying in Murren while you’re in the area. 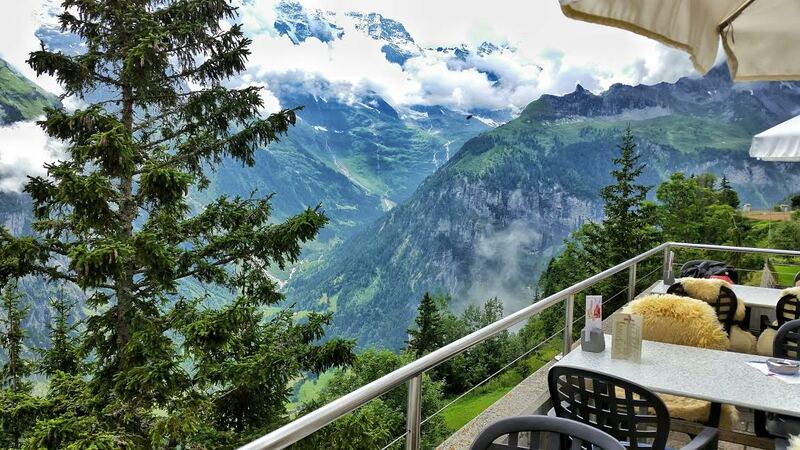 We had lunch at Hotel Edelweiss while we were in the area and the views from that hotel were absolutely breathtaking! 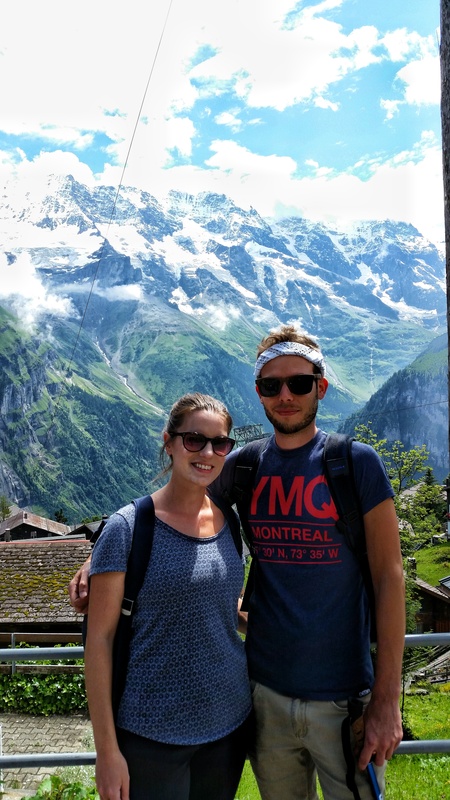 Gimmelwald would also be an amazing place to base yourself. Hi, my husband and I are planning a trip to Switzerland next year. What time of year did you go?